President Jorge Sampaio Office is located in an historical State-owned building – Casa do Regalo, at the top of the Necessidades Park, near the Ministry of Foreign Affairs, in Lisbon. The Casa do Regalo is a neoclassical building ordered by King Charles I in the beginning of his reign in 1889, to be used as a painting studio by his wife Queen Amelia (1865-1951)i. Queen Amelia soon became concerned with the fight against Tuberculosis – the evil of the century – having promoted in 1893 the foundation of the first Dispensary, in Alcântara, near the Royal Palace in Lisbon, for poor children under the supervision of Prof. Prof. Augusto da Silva Carvalho. Due to her efforts and persistence, on July 3rd. 1899, the Assistência Nacional aos Tuberculosos – a society for the fight against Tuberculosis, was founded. She also gave her patronage to the creation of the Instituto de Socorros a Náufragos, in 1892, and the National Coach Museum, in 1905. It appears that the new Casa do Regalo was erected on the location of a former building used by the Oratorians as an Astronomical Observatoryii. According to the antiquarian Vilhena de Barbosa, writing in 1862 in the «Archivo Pitoresco», the origins of the name – Casa do Regalo (Resting House), might be found in the fact that the former observatory was used as a resting house after the extinction of the religious orders and the departure of the Oratorians from the nearby Convent in 1833-34iii. After the advent of the Republic in 1910, the former Convent was occupied by Army Departmentsiv and the Palace, by the Ministry of Foreign Affairs, in 1916. The former painting studio of Queen Amelia was then rented to artists to be used as studios, till 2002. In May 2005, the Treasury affected the building to the Secretariat-General of the Presidency of the Republic so as to become the future Office of President Jorge Sampaio upon ceasing office. As the building required rehabilitation and adaptations for its new use, a plan was asked to the Ministry of Public Works (the last interventions had taken place in the ‘60’s and in 1991-93). The building was remodelled and restored under the direction of Architect Pedro Vaz, from the Public Buildings and National Monuments Direction-General. The works were undertaken by the Secretary-General of the Presidency of the Republic, and lasted from August 2005 – June 2006, under the supervision of Eng. António Correia Abrantes, Under-Director-General of the former public department. The restoration works begun in June 2005 and was completed one year later. From June 2006, President Jorge Sampaio works daily at this restored building as the UN High Representative for the Alliance of Civilizations and the UN Secretary-General Special Envoy To Stop TB. i cf. José Albuquerque Carreiras, A Evolução das Necessidades: do barroco ao paisagismo, in «Necessidades. Jardins e Cerca», (coord. ed. de Cristina Castel-Branco), Lisboa, Livros Horizonte e Jardim Botânico da Ajuda, 2001, p.121 e ss. 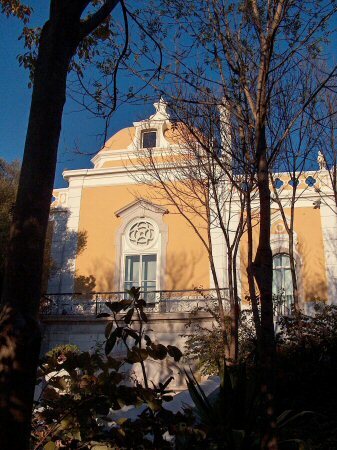 ; Ambassador Manuel H. Côrte-Real, in O Palácio das Necessidades, Lisboa, M.N.E., 1983, alludes to it, calling it «a pavilion for the queen to draw and paint», p. 56.
iii Vilhena de Barbosa, Inácio, Real Quinta das Necessidades, in «Arquivo Pitoresco», nº 18, Lisboa, 1862, p.142. iv Namely, the Headquarters of the 1st Army Division, transferred from the Almada Palace and later the Military Government of Lisbon according to Norberto de Araújo in Peregrinações em Lisboa, vol. II, livro IX, Lisboa, Parceria A. M. Pereira, [1938-1939], p. 18.